Description: This artifact is a round, wooden bucket made with slats, with a wooden handle. It measures 9 3/8 x 8 7/8 inches in diameter. The bucket is stained inside. 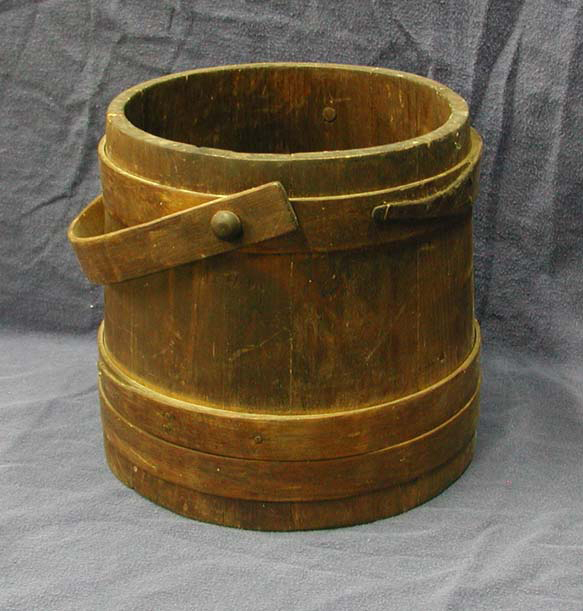 History: This bucket belonged to the Stellar family and was used on their Pender County blueberry farm. Mr. Wesley F. Stellar (1921-2005) was born in Royalton, Ohio in 1921. He served in the army in World War II, and he married a Pender County woman, Mary Belle Henry (1922-2003), in June 1945. The Henry family had lived and farmed in Pender since before the Civil War. In 2006, the Museum purchased this blueberry bucket at auction with a number of other artifacts from the 1950s and 1960s blueberry industry. It is a typical blueberry collecting bucket. Most commercially grown blueberries are picked by hand if they are going to be sold fresh. Pickers used wooden buckets instead of metal since the berries “sweat” less in wood, which preserves the quality of the fruit. North Carolina’s commercial blueberry farming began in the 1930s, when farmers from New Jersey moved south to take advantage of the longer growing season. World War II interrupted the development of the industry, but by 1966 there were about 4,000 acres of cultivated blueberries in North Carolina. In 2011, U.S. blueberry growers harvested more than 500 million pounds of fruit and North Carolina was ranked as the fourth producer state in the nation.